The following data is for Gold Prices in 1988. 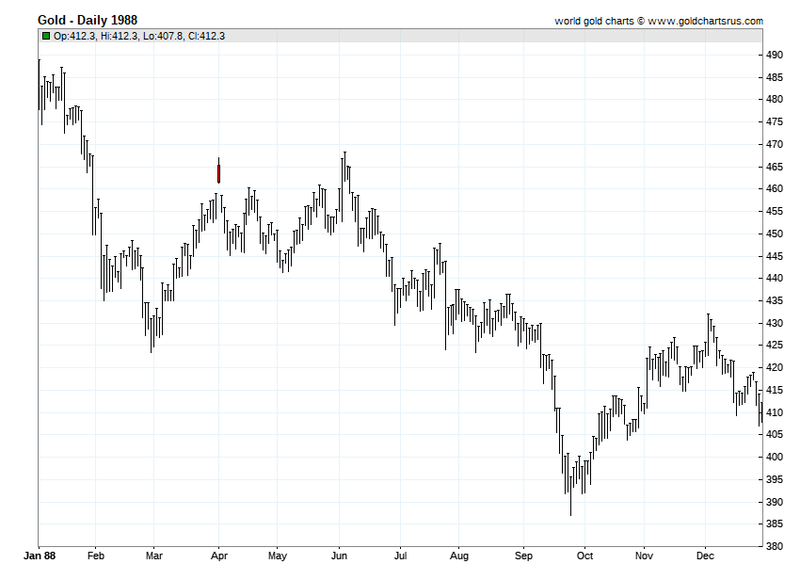 Further Gold Price history and information can be found on our live Gold Price page. Click the year of your choice below for both Daily Gold Price History and Yearly Gold Price Charts throughout this ongoing Fiat Currency Era. London Bullion Market Association: LBMA Gold Price Auction, expected auction start London time locally around 10:30 AM and 15:00 PM. Gold fix prices represent composite prices arrived at by various trading banks and brokerages in the over-the-counter Gold bullion markets. Foreign exchange (forex) prices are the most widely quoted in the precious metals industry. Worldwide forex gold markets trade continuously 24 hours a day from Sunday evening 6:00 PM (Eastern Time) to Friday 5:00 PM (Eastern Time). Viewer acknowledges and is in agreement that SD Bullion does not guarantee the accuracy, timelines, or completeness of price data displayed here. Nor shall it be liable to any individual or any entity for any delays, inaccuracies, errors or omissions in this price data or any other damages arising in connection with viewer's receipt or use of this data. SD Bullion offers customers the ability to purchase physical precious metal bullion products for asset preservation and prudent allocation purposes, not for mere speculation. Using our online price data, market commentaries, and opinions for speculative purposes is not advised, we are not financial planners nor certified to give you any financial advice whatsoever. Information here is merely for educational purposes. LBMA Gold price fix history data is posted with permission. All rights are reserved.